THE WINNER OF LAST WEEK'S CONTEST FOR A COPY OF THE MOVIE LANTERN HILL IS STEPHANIE @ SIMPLE THINGS. Congrats, Stephanie! Magic for Marigold is perhaps one of Montgomery's lesser known works but that doesn't mean it's not worth a read. If you haven't stumbled across a copy of this one, then I'm here to offer you an opportunity to nab it and read! The eccentric Lesley family could not agree on what to name Lorraine's new baby girl even after four months. Lorraine secretly liked the name Marigold, but who would ever agree to such a fanciful name as that? When the baby falls ill and gentle Dr. M. Woodruff Richards saves her life, the family decides to name the child after the good doctor. But a girl named Woodruff? How fortunate that Dr. Richards's seldom-used first name turns out to be . . . Marigold! A child with such an unusual name is destined for adventure. It all begins the day Marigold meets a girl in a beautiful green dress who claims to be a real-life princess. . . . 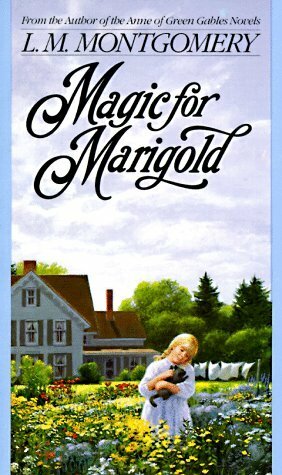 I picked up a gently used copy of Magic for Marigold and would like to pass it along to one of you! THIS CONTEST IS NOW CLOSED. THE WINNER IS #26 - Stephanie's Mommy Brain! Congrats, Stephanie! I just love the storyline and would love to read this book. I would like to read it, it sounds really good. Incidently, I had a garfield lookalike cat, I named marigold. Oh, I would love to win this book thanks. yes we are doing the reading challenge. thanks for a second try to win. This sounds very, very fun!! Would love to read this. I do not currently own a copy and would love to add it to my Anne Collection! I don't think I have heard of this one. Count me in! I missed the info. about a second entry for participating in the challenge til I saw it in a few people's comments! (Duh, read more carefully Barbara!) I am in. I need to start building my Montgomery collection for myself and my daughter, so I would love to win this! I'm always happy to add L. M. Montgomery to my library! I'm part of the challenge! I love L.M. Montgomery. It has been a long time since I read this one, but would love to remedy that! We would love to add this to our shelves! This is one of her works I haven't had a chance to read yet, please enter me. This book is new to me. Would love a chance to win. Thanks! I am doing the challenge so here's my second entry. Again, thanks! I'm in the challenge. 2 posts so far. Considering watching Anne today with my kids and posting about it tomorrow. We'll see how the rest of the day goes. I've never heard of this book, but it looks like a fun read! Maybe I'll get to try it! I need one! I haven't read this one for a really long time! Oh yeah, this is my second comment!